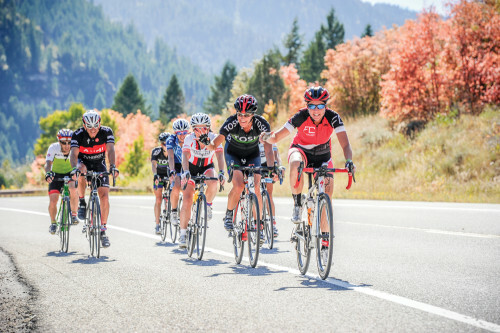 Layton, Utah — On Sept. 10 almost 1,800 cyclists will race or ride 206 miles from Logan, Utah to Jackson Hole, Wyoming in the 34th annual LoToJa Classic. The 206-mile course (332 kilometers) — ridden all in one day — features nearly 10,000 vertical feet of climbing across three mountain passes. Cyclists will start at dawn at Sunrise Cyclery in Logan and cross the finish line hours later at Jackson Hole Mountain Resort with the iconic Grand Teton in view. But before seeing the grandeur of the Teton Range and Jackson Hole, cyclists from the U.S. and foreign countries will ride on county and state roads in northern Utah, southeastern Idaho and western Wyoming. Along the way they’ll pass through Logan and Cache Valley, Utah; Preston and Montpelier, Idaho; and the Wyoming communities of Afton, Alpine and Hoback Junction. According to LoToJa Race Director Brent Chambers, everything is in place for another great event. “With the right conditions in terms of wind and temperature, we just may see a new set of course records this year,” he said. Cameron Hoffman of Clearfield, Utah set the current men’s record of 8:45:38 in 2014. His average speed was over 23 mph. Melinda MacFarlane of Salt Lake City, Utah holds the current women’s record of 9:35:00. She set it in 2013 with an average speed of approximately 21 mph. Most of the other cyclists usually cross the finish between 10 to 12 hours. Despite LoToJa’s challenge to cyclists’ fitness and courage, many return year after year. Chambers said in 2016 cyclists are coming from 38 states, some as far away as Florida and Hawaii. From outside the U.S., riders are coming from Canada and the Czech Republic — but most are from Utah and other western states. LoToJa began in 1983 by two Logan cyclists who wanted to create a bicycle race that resembled the difficulty of a one-day European spring classic like Paris-Roubaix, Ronde van Vlaanderen or Liege-Bastogne-Liege. In that first year, seven cyclists competed and crossed the finish line near downtown Jackson. The winner was Bob VanSlyke of Logan who finished the 186-mile course in 9 hours. Since then, LoToJa has become one of America’s premier amateur cycling races. It has also become a major fundraiser for the Huntsman Cancer Foundation, Autism Spectrum Disorder Connections, and other medical research foundations. To date, sponsors and participants have raised more than $1.7 million for these causes. In addition, LoToJa sponsors local fund-raising groups that assist the event. This year’s race again serves multiple categories for USA Cycling license holders, plus a cyclosportive class, which consists of non-licensed cyclists who are either competing against riders within their age group, or are just riding for fun. A relay race, and categories for tandem riders, will also be held. LoToJa is the longest one-day bicycle race in America that is sanctioned by USA Cycling, the sport’s governing body. The age of cyclists range from 13 to 74 (13 to 81 in the relay category), and the average rider will burn up to 15,000 calories on race day — about a dozen large cheeseburgers with fries. This year’s race will again involve over 500 volunteers. Due to the mountainous and remote terrain, more than 150 volunteer HAM radio operators from the Bridgerland Amateur Radio Club provide communication. He also emphasized LoToJa’s top goal is to have a safe race for all cyclists, support crews, and volunteers. Motorists traveling LoToJa’s course on Sept. 10 are asked to use caution when approaching cyclists. Groups consisting of up to dozens of riders may be encountered. Motorists are urged to pass carefully and to leave a safe distance between their vehicle, cyclists and other traffic. Chambers defined “cautious passing” as slowing down, giving plenty of space (at least three feet) between the vehicle and cyclist(s), and patiently waiting for oncoming vehicle traffic to clear before pulling around a cyclist or group of cyclists. Cyclists who compete in the event, plus their support crews, well wishers, event staff and volunteers, represent an entourage of approximately 4,000 people. Several of the communities through which LoToJa passes organize roadside fundraisers to capitalize on the influx of visitors. The host cities of Logan and Jackson also enjoy a welcomed economic boost from the race, specifically restaurants and hotels. The youngest boy and girl finishers last year were 13 years old. The average age of a LoToJa participant is 45. LoToJa’s route and additional information about the race are available at www.lotojaclassic.com.